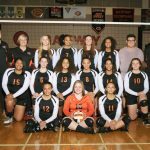 Thursday, October 1, 2015 7:00 PM Gateway High School AWAY 3 Adams City High School HOME 0 Game Recap The Gateway Olympians volleyball team won Thursday’s away conference match against Adams City by a score of 3-0. Saturday, September 12, 2015 6:00 PM Far North Warriors AWAY 0 Gateway High School HOME 2 Game Recap The Gateway Olympians volleyball team won Saturday’s neutral tournament match against Far Northeast Warriors by a score of 2-0. Saturday, September 12, 2015 12:00 AM Gateway High School AWAY 0 Overland High School HOME 2 Game Recap The Overland Trailblazers volleyball team won Saturday’s neutral tournament match against Gateway by a score of 2-0.